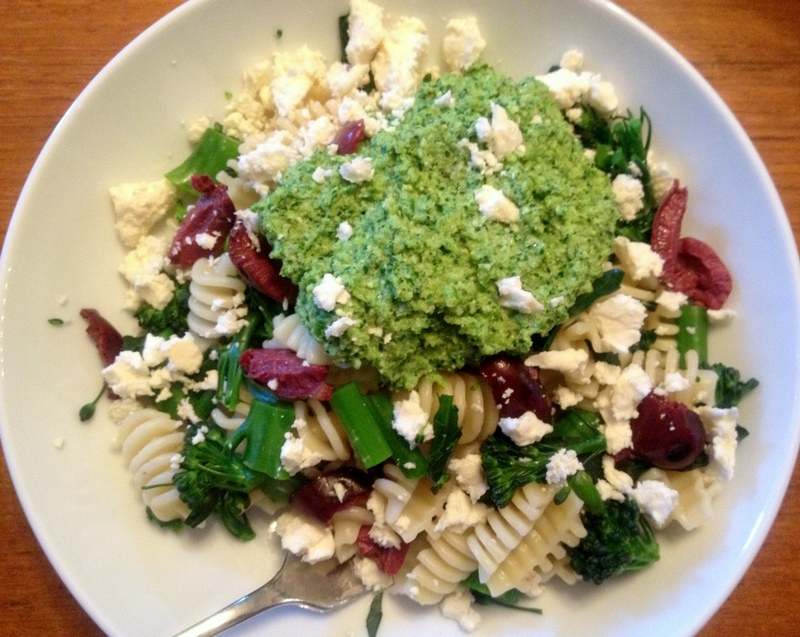 Broccoli Pesto Pasta with Olives and Feta: Bring a large pot of water to a boil. Chop a pound of broccoli into large florets, peeling and chopping the stems, and boil about 30 seconds, until bright green and crisp-tender. Remove from water with a tongs or slotted spoon and drain. Bring the water back to a boil, salt it generously, and cook half a pound of pasta according to the package directions. While the pasta is cooking, chop the cooked broccoli and transfer half it to a food processor, reserving the remaining chopped broccoli. To the broccoli in the food processor, add 3 Tb. pine nuts, 1/4 tsp. salt, 1/4 c. olive oil and 2 Tb. of the pasta cooking water. Blend thoroughly, scraping down the sides a few times and adding more oil or water to achieve a smooth, sauce-like consistency. Drain the cooked pasta and toss with the broccoli pesto, reserved broccoli florets, torn kalamata olives, and feta cheese. Offer ground pepper at the table. Yum! Your friend-filled week sounds as delicious as this meal. Thanks for sharing! You are so right about the automatic bond among people who spend the day in serious contemplation of what to eat next! Thanks! It was really good. I’m looking forward to making it again soon! I am all about pureeing broccoli…I especially like Broccoli, Cheddar, and White Bean soup. Looks great!! That sounds like a great soup! Is that a recipe we might find on your blog? If so, please post that link right here! I am glad too that your baby loves olives! This looks gorgeous (and I am into this sort of thing for sure!) – I bet the conference was fun..I was following vicariously through twitter..maybe next time if it is in Seattle again! That looks delicious! I am going to a food writers conference the end of July and I can’t wait! Big plus that it is here in town and I don’t have to travel for it. How fun! I spent most of my time at the photography and basic website sessions, but it was hard to miss out on the writing part! Next time. Have fun! I’d like to try a pesto with broccoli. I bet it has a nice earthy taste. It did! Adding the pine nuts and olive oil give it a rich depth of flavor.